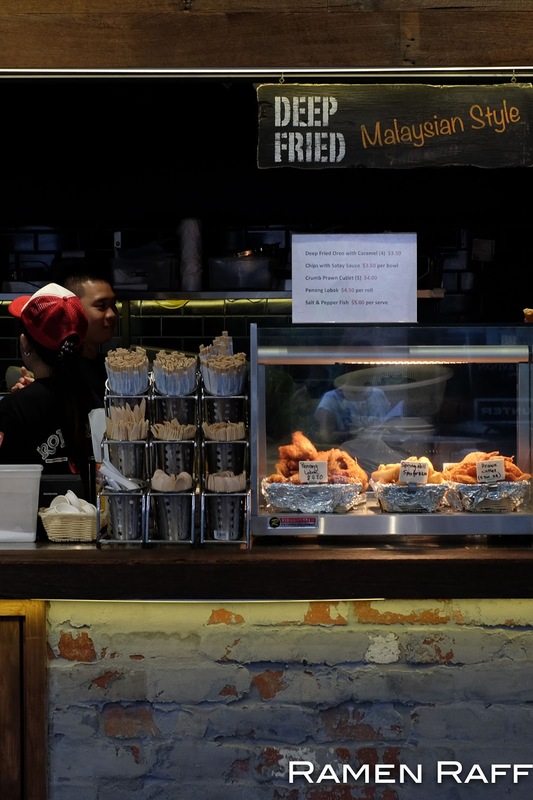 A lot of people would agree with me when I say that the hawker food scene in Asia is amazing! The food and vibe just stimulates ones senses. Imagine the sound and sight of various woks tossing, chicken being deep-fried, the beautiful aroma of grilled bbq meats and seafood etc. At Kensington Street's Spice Alley, you can experience that similar dining scene. 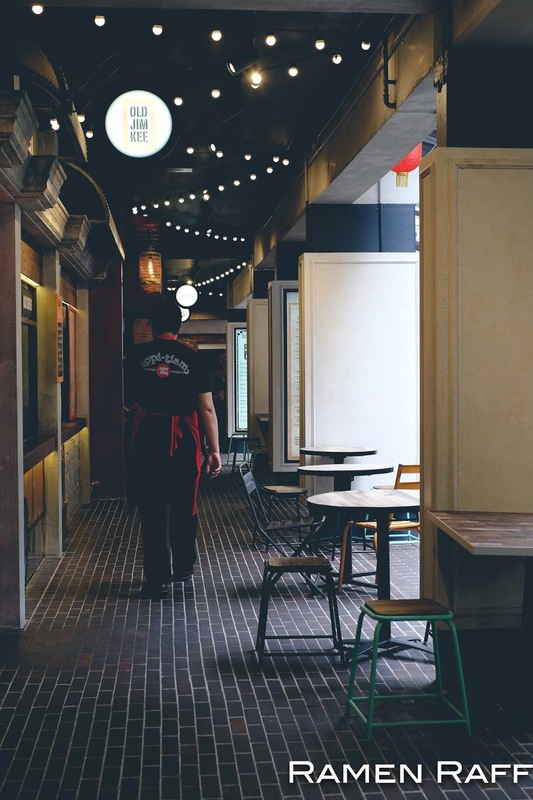 Expect shops with mouthwatering dishes from different Asian countries like Malaysia, Singapore, Hong Kong, Thailand, Japan etc. 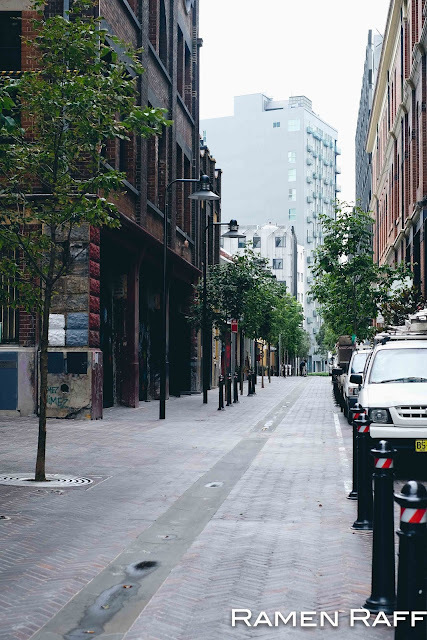 Kensington St is one of Sydney's latest dining destinations and is located in Chippendale right next to Central Park. 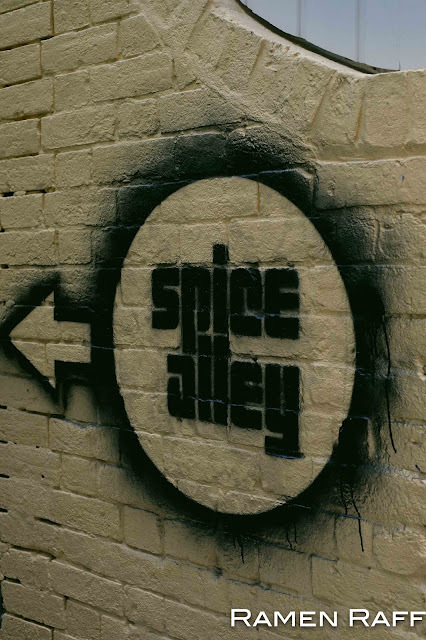 Through a little laneway (closer to the Outram Street end of Kensington Street), you'll find a wall-painted sign that will point you to the direction of Spice Alley's location. Then you'll find yourself in a vibrant alfresco dining area with glowing lantern ceilings. 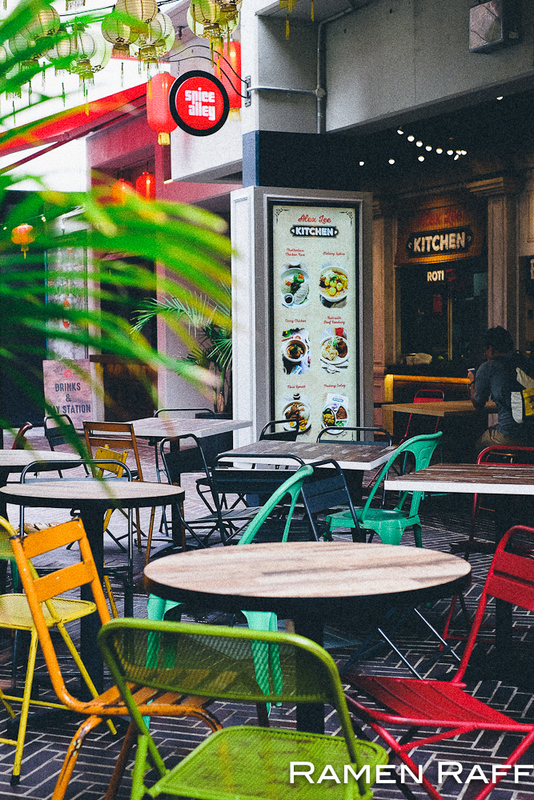 Choose dishes and drinks from various Kopi-tiam/hawker-style shops. We tried two stalls on this occasion: Alex Lee Kitchen and Old Jim Kee. 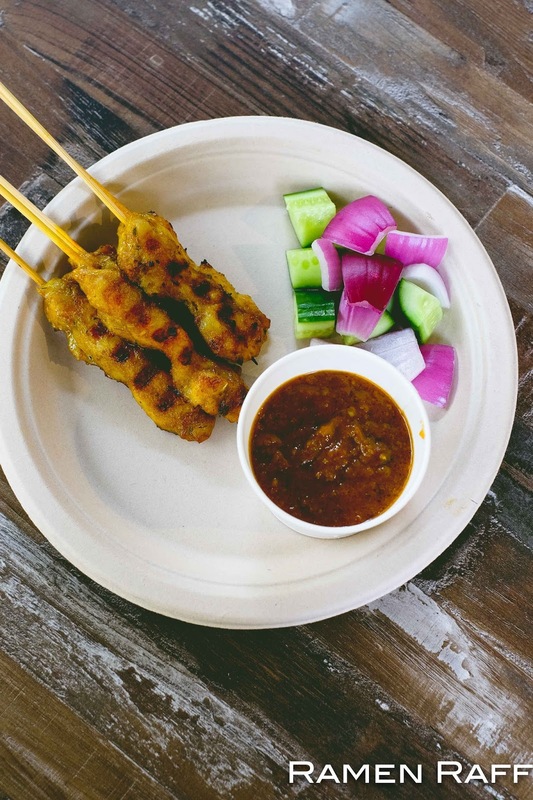 We ordered some Padang chicken satay sticks ($10) to share. There were 5 Singaporean-style chicken satay skewers and generous satay dipping sauce with pieces of onion and cucumber on the side. The chicken was nicely cooked and smoky. The thick dipping sauce itself had a nice balance of peanuty, sweet and gingery flavours. The Katong laksa ($10) was also a winner! Normally the Singaporean-style Katong laksa would have seafood in it but here, you have a choice to either have chicken, prawns, pork balls, fish balls or vegetables for your toppings. It also came with thin rice noodles and tofu. I like that it had minimal toppings but quite generous with the chicken. 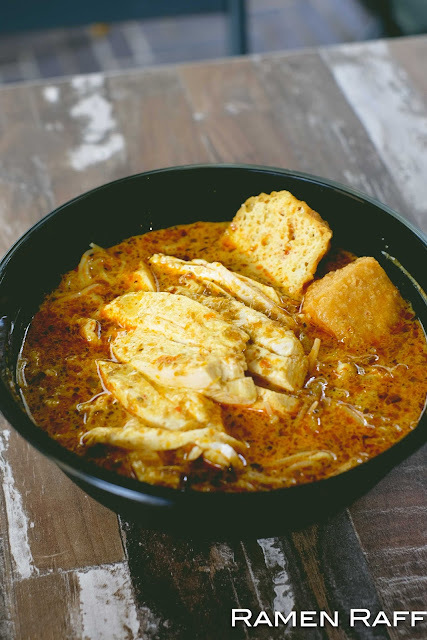 That way, the flavoursome laksa super lemak (aka fatty, creamy and rich) soup remains the star of the dish. Their Chatterbox chicken rice ($10) is pretty good too! 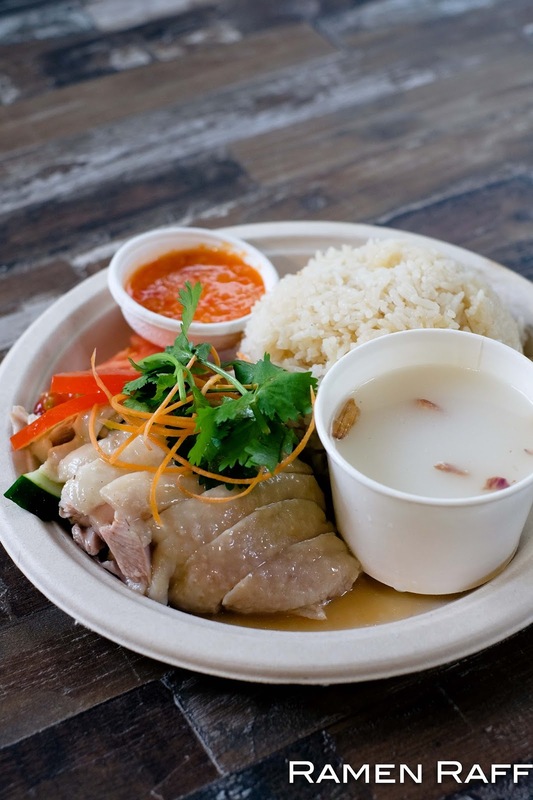 This is their version of the Hainanese Chicken rice. Oh man! It certainly took me back to Maxwell Hawker Center back in Singapore! The shimmering and succulent poached chicken thigh was perfectly cooked. Along with the chilli ginger sauce and extra flavoursome chicken rice, it was gold! We also indulged in some of Old Kim Jee's Malaysian cuisine starting with their Penang Lobak (aka Loh bak or Lor bak). 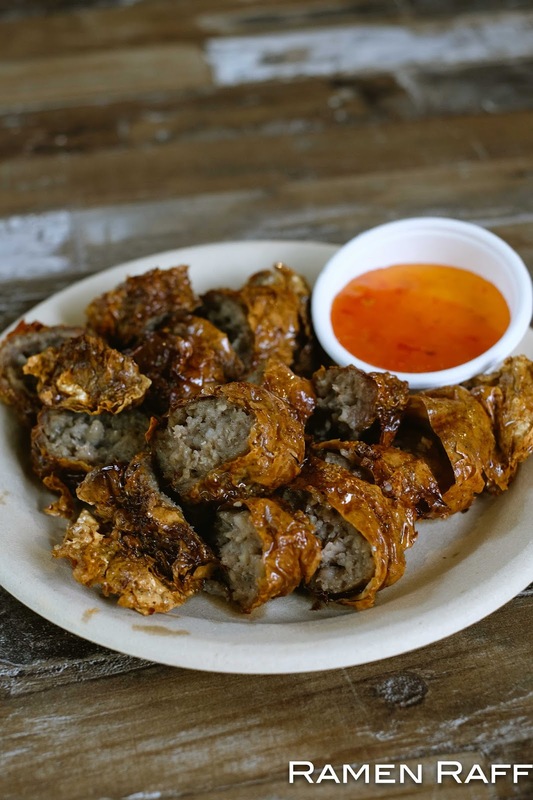 This Malaysian classic dish is pork marinated in five spice, wrapped in think bean curd skin and then deep fried! The skin was nice and crisped. The pork was juicy and tender bursting with five spice flavour and aromatics. You need to try this if you haven't! It is legit and off the chainz! 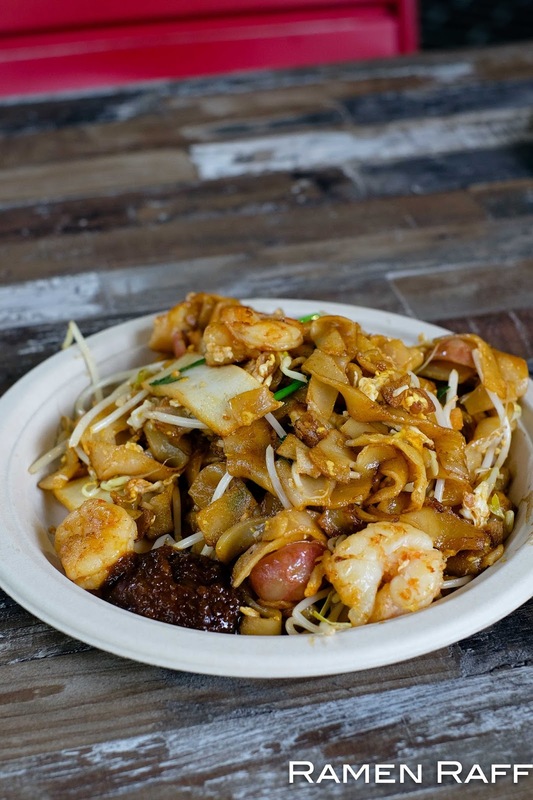 Another classic is their Char Koay Teow aka CKT ($10). CKT is definitely my favourite Malaysian Chinese dish and their version did not disappoint. It had wok hei, generous amounts of prawns, lap cheong (Chinese sausage) and amazing crispy pork fat bits! Stir in the sambal on the side to give the dish a more vibrant taste! We also got some amazing Malaysian beverages. 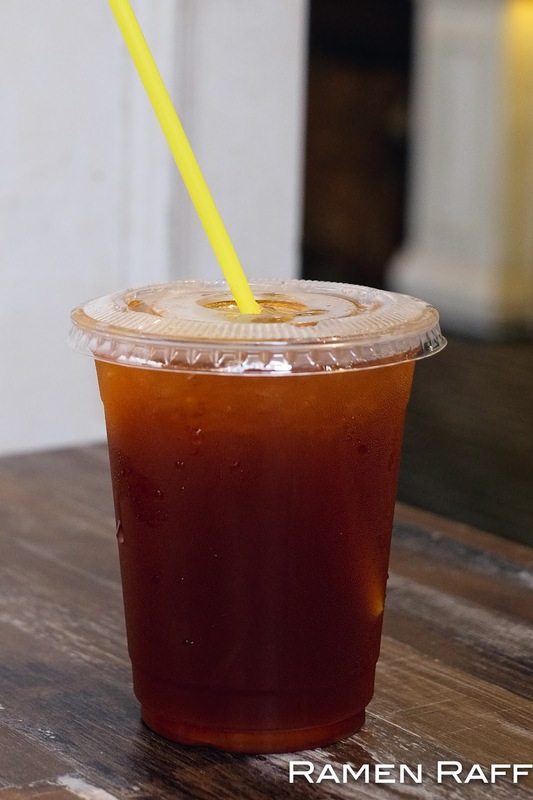 The ice lemon tea ($3.50) was a refreshing sweetened drink with a nice balance of light black tea and citrus flavours. I loved their ice teh tarik ($3.50) too! It wasn't too sweet and the amount of milk did not mask he flavours of the tea. For its location, food quality and amount, I thought the prices were very reasonable. I will be hitting up Spice Alley next time for their ramen at Ky-Oto and the HK-style Beef Brisket with noodles at Hong Kong Diner. Heads up! 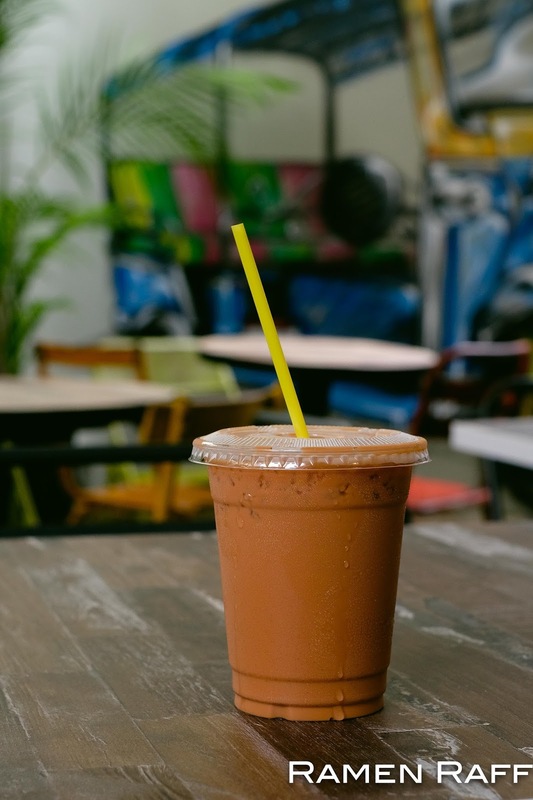 You can only pay with Paywave cards or Kopi-tiam Spice Alley cards (which can be bought in the premises).